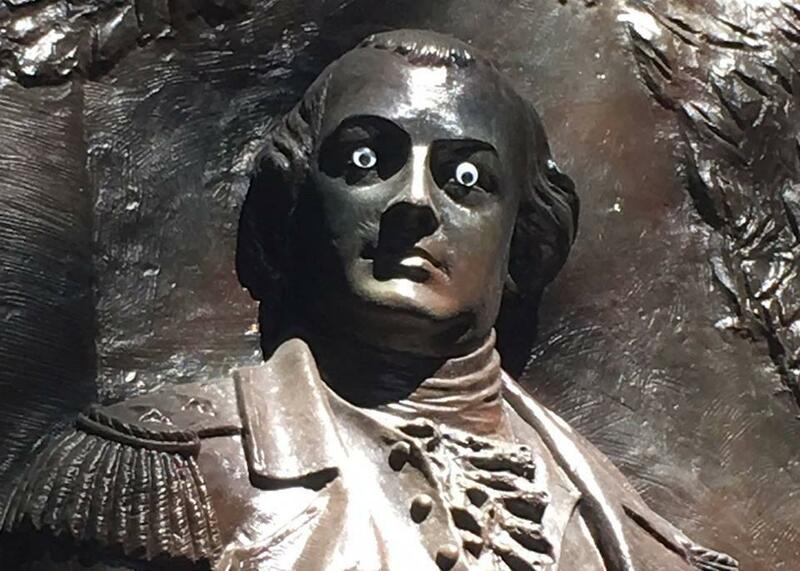 Statue of Revolutionary War general vandalized with "googly eyes"
The city of Savannah, Georgia, has its eyes out for a vandal who put "googly eyes" on a statue of Revolutionary War general Nathanael Greene in a prank that has Facebook users rolling with laughter. The city government posted a call for answers to Facebook on Thursday, including photos showing the Greene statue with the expressive eyes. "Who did this?! Someone placed googly eyes on our historic #NathanaelGreene statue in #JohnsonSquare," the post said. "It may look funny but harming our historic monuments and public property is no laughing matter, in fact, it's a crime." The city urged anyone with information to contact the Savannah Police Department. The department has made no arrests and identified no suspects, spokeswoman Keturah Greene — no relation — told CBS News. But the city is already seeing plenty of gags about the googly eyes. Since the Facebook post Thursday, dozens of users have been posting other googly eyes photos in comments on the city's page. Greene was a major general who was second in command in the Revolutionary War and served with George Washington. He moved to the Savannah area after the war. His body was placed in the city's Graham Family Vault for more than 100 years before it was found and reinterred in 1902 in the base of the Johnson Square monument, according to the Georgia Historical Society. Greene, the police spokeswoman, said the monument was not damaged, but the suspect could face a misdemeanor criminal trespass charge for crossing a barrier to get to the statue. As for why someone would set their googly eyes on the statue, police have yet to see a reason. "Once they're able to pinpoint who did it, they'll probably be able to figure out why that happened," Greene said.